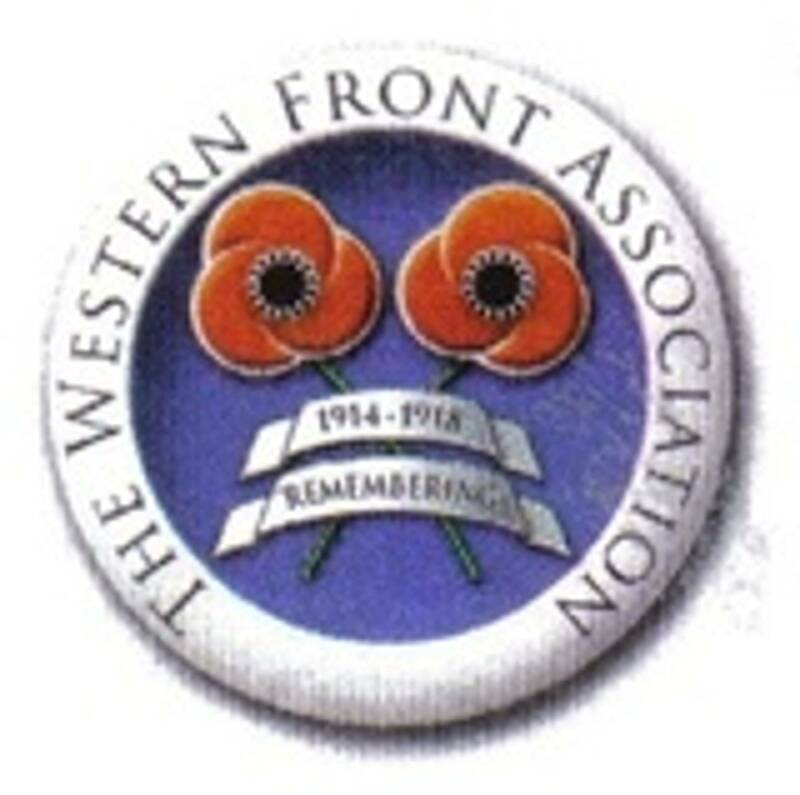 Branch Meeting, 17 September, 2016. It appears that Michaels papers did not survive the Blitz in WW2, however, from what I have been able to piece together it would seem that he was born in 1886 to Thomas & Mary Aspill, his birth being registered in Dublin South. The 1911 Census show that the family lived in Limekiln Lane, in the Rathmines/Rathgar West area of Dublin, and that Michael worked as a ‘Linen Bleacher’. Surviving Army records (Register of Soldiers Effects) show that his effects were sent to his widow, Catherine, Civil records show that a Michael Aspill married Catherine Kane in the Dublin South registration area on 29 December, 1915. The ‘Soldiers Died in the Gt. War’ database tells us that he enlisted in Dublin and research into the Irish Guards numbering during the Gt. War tells us that his number, 9116, was issued between 1 July and 6 August, 1915. At some stage after this date Michael must have proceeded to France to join up with the battalion which was part of the 1 (Guards) Brigade and which, on 15 September took part in the Battle of Flers-Courcelette. Rudyard Kipling’s book on the Irish Guards tells us that: On the evening of the 14th, the 1st Brigade of Guards moved out to the shell-holes and fragments of trench that formed their assembly-positions, on a front of five hundred yards between Delville Wood and the northern flank of Ginchy. There it lay in the cold with the others till “Zero,” 6.20A.M. Of the 15th. The 2nd and 3rd Coldstream had the front line, for they were to lead the attack; the 2nd Grenadiers lay behind to support them and consolidate the first objective—a line of trench about twelve hundred yards north-east—and to hold it till the 1st Irish Guards came up and had passed through them. Then, if the flanks were secure, the 2nd Grenadiers were to come on and support in turn. The 1st Irish Guards were to pass through the 2nd and 3rd Coldstream after the latter battalions had reached the third objective, another line of trench twenty-five hundred yards off, and were thence to go and take the final objective—the northern outskirts of Lesbœufs, thirty-five hundred yards from their jumping-off place. The CWGC site says that: At 6.20am on Friday 15 September the advance began in mist and smoke. The Guards Division, amidst much confusion, advanced north-east of Ginchy some 2,000 yards but ended up short of its final objectives. Despite some notable successes the day's principle objectives were not gained; there was no dramatic breakthrough. The Battalion War Diary states that they were relieved by the Lincolnshire Regiment at about 5.30am on 17 September, but that the Lincolns arrival was observed and drew shell fire which led to a very rapid and difficult relief. When the battalion had fully assembled at the southern edge of Bernafey Wood, the roll call showed that they had suffered 347 casualties. 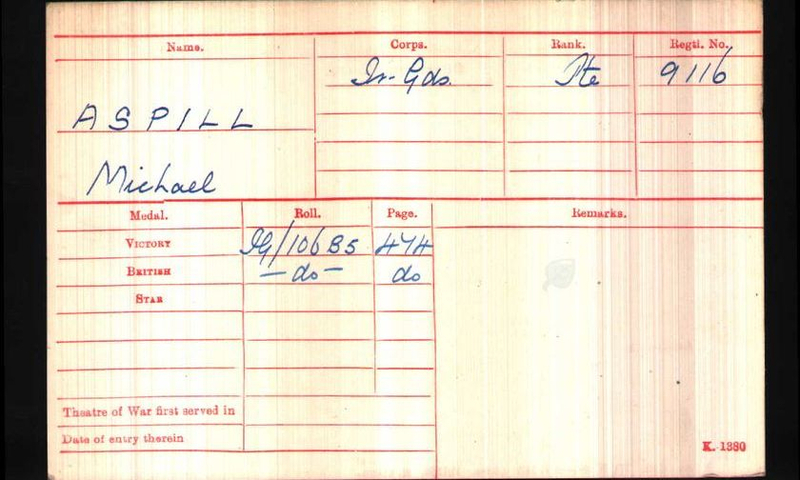 Michael was one of those casualties, I can only presume that he was either seen alive or was seen to be killed on 17 September in order for the CWGC to be certain that he was killed on that date. He was entitled to the British War and Victory Medals and is buried in the London Cemetery Extension. There is just one more piece to Michaels story, it seems that he has not always been buried in the London Cemetery Extension. When looking at his entry on the CWGC I came across this attachment shown below. This shows that Michael was originally buried in a single ‘grave’ with two other British soldiers and two Germans. The three British soldiers were originally all described as ‘Unknown British Soldier’ however, the entry for the third of these was then amended to 9116 Pte M. Aspell, 1st Bn. Irish Guards 19/9/16, due to the fact that a piece of belt with the name M. Aspill and a sheet of paper marked 9116 were found in the grave. On a British Army map from early September 1916, the position of the ‘grave’ quite near to the German trenches. It would seem likely that Michael and his four ‘comrades in arms’ were initially buried in a ‘battlefield grave’, quite possibly in a shell hole and that they remained there until found in early 1935. It would seem that when he joined the Army his name was registered as Aspell and consequently this spelling has been used on the CWGC ‘Debt of Honour’ and the ‘Soldiers Died in the Gt. War’ database etc. It is not clear from the Burial Return form, how it was decided which of the three British bodies was Michaels, it is likely that the letters R. B. in the column ‘Regimental Particulars’ relates to the Rifle Brigade (battalions of which were involved in the Battle of Flers-Courcelette) and were the ‘Titles’ mentioned in the ‘Means of Identification’ column. Consequently, by a process of elimination, if those two men were in the Rifle Brigade, the belt and paperwork had to belong to the third body.